Due to the situation getting increasingly out of hand, I must require that use of my images as source material for commercial ventures (products, popular books, articles, documentaries, films, exhibits and so forth, as well as nonprofit public efforts) is not acceptable, unless prior arrangements are made with yours truly. Those who wish to pursue paleoart without my involvement need to produce entirely original work (see statement below). I have succeeded in receiving compensation for unauthorized work. Sorry for any trouble this may cause, and many thanks for your understanding and cooperation. To a greater extent than any other single artist I established the modern or “New Look” of dinosaurs, starting in the 1970s and 80s. One reason for this accomplishment is the unique library of exceptionally technically accurate skeletal restorations covering nearly every species of dinosaur I have built up. This has resulted in what has become known as the “Greg Paul Look" of dinosaurs. The work often requires extensive effort on top of a high level of skill and knowledge, some of which I have detailed in academic papers. Because of the scientific effort dedicated to the research my illustrations cannot be exceeded, and are rarely matched, in technical quality. Because my work is so groundbreaking and original, I am an artist that contractors can rest assured there will be no problems stemming from the standard contract clause that ensures that the art I am providing does not violate others' copyrights. This is not always the case with some other illustrators. I have recently been compelled to require that a large number of other paleoartists not use my work as source material for their restorations of dinosaurs and other prehistoric creatures as stated above. This is because those tasked with producing nonfictional documentaries, exhibits, books, articles, commercial products and the like, have gotten into a truly bad habit. In case after case, second tier artists whose art is based to a major extent on mine are being contracted to provide or produce images for most projects. This is inappropriate for reasons that you should consider. One is the high risk of loss in accuracy when turning to second tier artists that derive their work from myself or others. Because they lack a sufficient knowledge base they are likely to either repeat errors for past published works that have become outdated due to recent advances in our knowledge, or because in failing to understand dinosaur biology they make changes that are incorrect. In addition, the scientific exertion that has to be invested in the highest quality paleoart is unlike most wildlife art in which the appearance of the subjects is well known and documented, or even fantasy creatures that are invented and do not require in-depth research. Because of the high level of skill and effort involved in restoring exotic extinct animals those conducting original restorations require a corresponding level of compensation. Because they have not expended major effort in designing dinosaurs, derivative artists are able to charge lower prices, underbidding the artist whose work they are utilizing. In effect some projects are getting that “Greg Paul Look” by engaging the efforts of those who are using my work to underbid me. This is because many projects over design the complexity of the project compared to the amount of money on hand available to properly compensate the talent. Doing so does not meet ethical standards on the part of either the derivative artist or those in charge of the project, and risks violating my copyrights. This can prove costly because I have in the past succeeded in obtaining substantial payments to compensate for violation of my copyrights. There has been growing concern in the paleontological community including the Society of Vertebrate Paleontology, as well as the illustrators community including The Guild of Biological Science Illustrators, about the issues addressed above, and many cheered when I made a statement to these communities. "It is extremely problematic to have artistic works essentially duplicated for commercial purposes. This is clearly unacceptable." "If you are outright copying Greg's work, you must stop. We all begin our life restorations by examining the fossil evidence - building muscles on drawings we've made and photographs we've taken of the bones. Our own research, our own drawings, our own poses - just copying what Greg has done is cheating. And you cannot really consider yourself a paleoartist if all you do is put some brightly colored "clothes" on a GP model. If you are charging too little for your work, perhaps because you have another means of income, you need to think about it. Enlightened self-interest dictates that, while fulfillment of a short- term goal like having your work reproduced is seductive, an artist is better served for the rest of his/her career by making sure that the profession of paleoart is valued. Advancing your career in a field that is poorly regarded is sort of pointless, and it is possible to destroy an art market by allowing standards to slip too low to make work worthwhile. The business of paleoart is tragically underpaid in general and problematic in that it requires those of us who are serious to do every bit of research paleontologists do to create our images but we have no institutional funding." "You're being nice with your statement. There is no question that copyright violations are utterly unacceptable. There is also no question that your drawings and restorations have had a profound (positive) influence on dinosaur paleontology and its public perception - thank you very much!" "I have seen some of these replicates on the web, and found it very upsetting. I hope some of the artists read your post and take heed of it." "I just read with interest your post to the SVP list regarding the use of your dinosaur reconstructions as reference work. With your permission, I'd like to cross-post it to the Guild of Natural Science Illustrator's list-serve as I think it raises many good points that would be relevant for that community." Art and life restorations and scenes of various sizes up to murals, black and white or color, for books, periodicals, exhibits, motion picture media and personal collections, commissioned or from library. The largest skeletal library in existence, includes almost all dinosaur species for which skeletal restoration can be done. Consultation, including scripts, and science advising for assorted projects including fictional movies and programs, documentaries, exhibits, commercial products, etc. 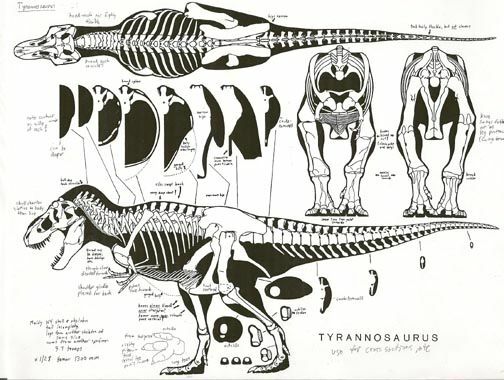 Body designs for 3-D dinosaurs whether sculptures, models and robots, or for digital animation (these include multi-view skull and skeletal restorations with a series cross-sections of head, neck, body, tail and limbs, plus other studies, plus other necessary details). Limb motion diagrams for animation (a sped-up sample using just three frames; up to eight are required for proper effect).